Here’s wishing everyone a happy and prosperous New Year. Let’s hope we see a bit more sunshine! Winter is beginning to bite in the UK with temperatures already dropping to below zero Celsius. Hardy Bonsai collections (outdoor varieties) will now benefit from a little protection. Move them to a sheltered spot where they are protected from the worst of the weather. Some of our members just plant them into the ground, others put their trees in sheltered places with coverings for protection, or in a shed, greenhouse or cold conservatory where there is still plenty of light. Deciduous trees will lose their leaves. Remove fallen leaves and excessive moss on the soil surface to deter pests and disease attacking the tree. It was a very cold and frosty evening to travel to our annual Social and Award Evening. The support of those who attended was greatly appreciated. 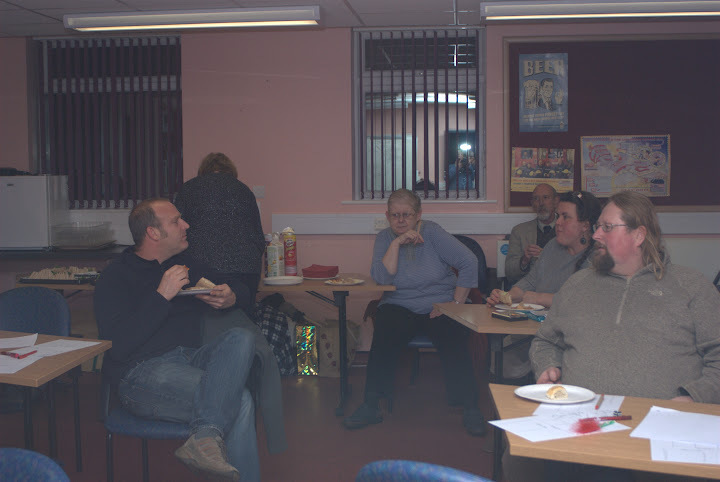 A plentiful variety of food was provided by Maureen and Elaine – Thank you ladies for your generosity. After eating until we were all too full, there was much laughter and hilarity as we pitted our wits in a Quiz based on beetles and Beatles; and then our prowess with the dice in a Beetle Drive. The men beat the ladies by winning all the prizes. 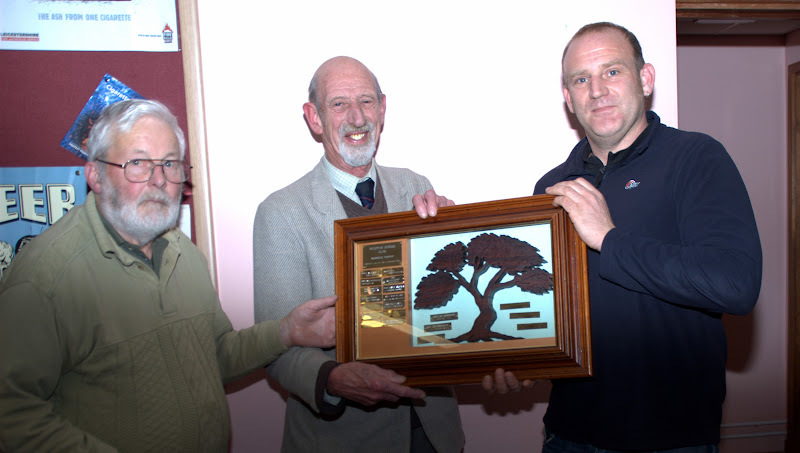 Robin Smart, a Club member for 30 years, was presented with the annual Wigston Bonsai Club Trophy by Club Chairman, Frank Mepham. The trophy is awarded to a member whose tree display at a local annual show receives the most acclaim by the general public. The trophy was handed over to Rob by last years winner Lee. Not only did Robin win the trophy, but he also whooped everyone in the Beetle drive and won himself a nice unglazed oval bonsai pot. Not to be outdone, Lee won the quiz with and bagged himself a little root over rock Cork Bark Elm. Santa is too busy dealing with Christmas Wish lists now and his Bonsai will have to wait until other work is done. Perhaps he will be delivering a new Bonsai to someone you know during his travels. Tell them about Wigston Bonsai Club. Just a quick reminder that there will not be a meeting in January, as we will all be too busy recovering from the New Year celebrations. The next meeting will be on Tuesday 5 February 2013, when we will be looking at structural pruning on deciduous trees. Whether you are new to the experience or seasoned experts, we like to share the knowledge. Please join us and bring a tree to work on. In the meantime, thank you for viewing our web site. 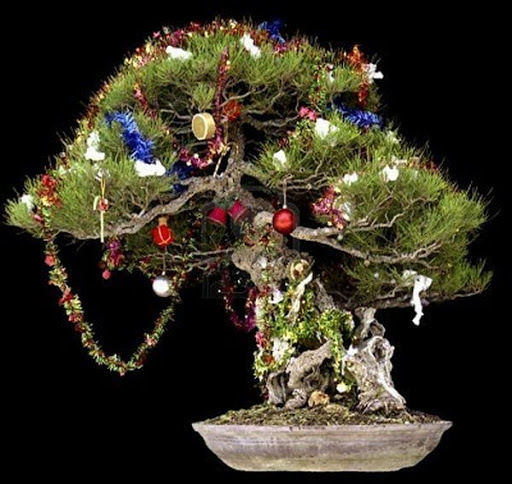 We send you Seasonal Greetings for Christmas and the New Year, with all good wishes for a happy Bonsai year in 2013.